A chaotic period of warfare ensued after the Russian Revolutions of 1917. The internationally recognised Ukrainian People's Republic emerged from its own civil war of 1917–1921. The Ukrainian–Soviet War (1917–1921) followed, in which the bolshevik Red Army established control in late 1919. The Ukrainian Bolsheviks, who had defeated the national government in Kiev, established the Ukrainian Soviet Socialist Republic, which on 30 December 1922 became one of the founding republics of the Soviet Union. Initial Soviet policy on Ukrainian language and Ukrainian culture made Ukrainian the official language of administration and schools. Policy in the 1930s turned to russification. In 1932 and 1933, millions of people, mostly peasants, in Ukraine starved to death in a devastating famine, known as Holodomor. It is estimated by Encyclopædia Britannica that 6 to 8 million people died from hunger in the Soviet Union during this period, of whom 4 to 5 million were Ukrainians. Nikita Khrushchev was appointed the head of the Ukrainian Communist Party in 1938. The prolonged Ukrainian crisis began on 21 November 2013, when then-president Viktor Yanukovych suspended preparations for the implementation of an association agreement with the European Union. This decision resulted in mass protests by pro-Europeans – events which became known as the "Euromaidan". After months of such protests, the protesters ousted Yanukovych on 22 February 2014. Following his ousting, unrest enveloped the largely Russophone eastern and southern regions of Ukraine, from where Yanukovych had drawn most of his support. An invasion by Russia of the Ukrainian autonomous region of Crimea resulted in the annexation of Crimea by Russia on 18 March 2014. Subsequently, unrest in Donetsk and Luhansk oblasts of Ukraine evolved into a war between the post-revolutionary Ukrainian government and pro-Russian insurgents. The Ukrainian crisis also very negatively influenced the Ukrainian economy. 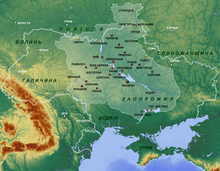 Settlement in Ukraine by members of the genus Homo has been documented into distant prehistory. The Neanderthals are associated with the Molodova archaeological sites (43,000–45,000 BC) which include a mammoth bone dwelling. Gravettian settlements dating to 32,000 BC have been unearthed and studied in the Buran-Kaya cave site of the Crimean Mountains. 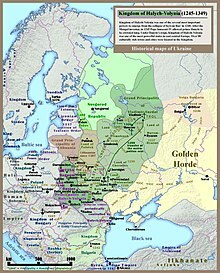 In the 5th and 6th centuries, the Antes Union was located in the territory of what is now Ukraine. 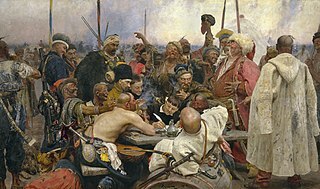 The Antes were the ancestors of Ukrainians: White Croats, Severians, Polans, Drevlyans, Dulebes, Ulichians, and Tiverians. Migrations from Ukraine throughout the Balkans established many Southern Slavic nations. 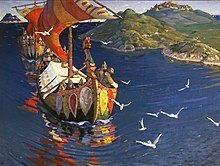 Northern migrations, reaching almost to the Lake Ilmen, led to the emergence of the Ilmen Slavs, Krivichs, and Radimichs, the groups ancestral to the Russians. 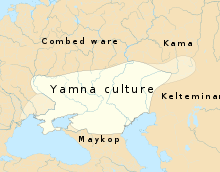 After an Avar raid in 602 and the collapse of the Antes Union, most of these peoples survived as separate tribes until the beginning of the second millennium. 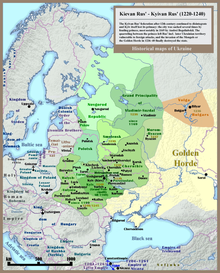 Kievan Rus' including the territory of current day Ukraine: last 20 years of the state (1220–1240). In 941 AD, the prince of Kiev invaded the Byzantine Empire but was defeated in the Rus'–Byzantine War (941). The baptism of Princess Olga in Constantinople. A miniature from the Radzivill Chronicle. Governorates of the Russian Empire during the 19th century in the territory of the later Ukraine. Ukrainian People's Republic poster during Ukrainian War of Independence, 1918. Our enemies will vanish like dew in the sun;We too shall rule in our country. Ukraine according to an old postal stamp from 1919. Territorial evolution of the Ukrainian SSR 1922–1954. Okrug Taganrog and Shakhty lost (1924); Polish Volhynia gained (1939); Transnistria lost (1940); Transcarpatia gained (1945); Romanian islands gained (1948); Crimea gained (1954). The Ukrainian War of Independence of 1917 to 1921 produced the Free Territory of Ukraine, Ukrainian Soviet Socialist Republic (in 1919 merged from the Ukrainian People's Republic and West Ukrainian People's Republic) which was quickly subsumed in the Soviet Union. Galicia, South Bessarabia, Northern Bukovina, and Carpathian Ruthenia were added as a result of the Molotov–Ribbentrop Pact in 1939 and the Soviet victory over Germany in the Second World War, 1939–45. The coat of arms of Ukraine, adopted 19 February 1992, show the tryzub or "trident", a design proposed in 1917 by Mykhailo Hrushevskyi for the Ukrainian People's Republic, ultimately based on a symbol stamped on Kievan coins by Vladimir the Great. The blue-and-yellow Flag of Ukraine was introduced on 28 January 1992, based on a flag used in the Ukrainian War of Independence in 1917/18. On 21 January 1990, over 300,000 Ukrainians organized a human chain for Ukrainian independence between Kiev and Lviv. Ukraine officially declared itself an independent state on 24 August 1991, when the communist Supreme Soviet (parliament) of Ukraine proclaimed that Ukraine would no longer follow the laws of USSR and only the laws of the Ukrainian SSR, de facto declaring Ukraine's independence from the Soviet Union. On 1 December, voters approved a referendum formalizing independence from the Soviet Union. Over 90% of Ukrainian citizens voted for independence, with majorities in every region, including 56% in Crimea. The Soviet Union formally ceased to exist on 26 December, when the presidents of Ukraine, Belarus and Russia (the founding members of the USSR) met in Białowieża Forest to formally dissolve the Union in accordance with the Soviet Constitution. With this Ukraine's independence was formalized de jure and recognized by the international community. The presidency (1994–2005) of the 2nd President of Ukraine Leonid Kuchma was surrounded by numerous corruption scandals and the lessening of media freedoms; including the Cassette Scandal. During Kuchma's presidency, the economy recovered, with GDP growth at around 10% a year in his last years in office. In 2004, Kuchma announced that he would not run for re-election. Two major candidates emerged in the 2004 presidential election. Viktor Yanukovych, the incumbent Prime Minister, supported by both Kuchma and by the Russian Federation, wanted closer ties with Russia. The main opposition candidate, Viktor Yushchenko, called for Ukraine to turn its attention westward and aim to aim to eventually join the EU. In the runoff election, Yanukovych officially won by a narrow margin, but Yushchenko and his supporters alleged that vote rigging and intimidation cost him many votes, especially in eastern Ukraine. A political crisis erupted after the opposition started massive street protests in Kiev and other cities ("Orange Revolution"), and the Supreme Court of Ukraine ordered the election results null and void. A second runoff found Viktor Yushchenko the winner. Five days later, Yanukovych resigned from office and his cabinet was dismissed on 5 January 2005. During his presidency (2010–2014) Yanukovych and his Party of Regions were accused of trying to create a "controlled democracy" in Ukraine and of trying to destroy the main opposition party Bloc Yulia Tymoshenko, but both have denied these charges. 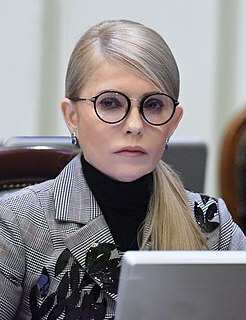 One frequently cited example of Yankukovych's attempts to centralise power was the 2011 sentencing of Yulia Tymoshenko, which has been condemned by Western governments as potentially being politically motivated. In March 2014, the Annexation of Crimea by the Russian Federation occurred. Though official results of a referendum on reunification with Russia were reported as showing a large majority in favor of the proposition, the vote was organized under Russian military occupation and was denounced by the European Union and the United States as illegal. Inside Ukraine 20th century historians were strictly limited in the range of models and topics they could cover, with Moscow insisting on an official Marxist approach. However émigré Ukrainians in Canada developed an independent scholarship that ignored Marxism, and shared the Western tendencies in historiography. George W. Simpson and Orest Subtelny were leaders promoting Ukrainian studies in Canadian academe. The lack of independence in Ukraine meant that traditional historiographical emphases on diplomacy and politics were handicapped. The flourishing of social history after 1960 opened many new approaches for researchers in Canada; Subtelny used the modernization model. Later historiographical trends were quickly adapted to the Ukrainian evidence, with special focus on Ukrainian nationalism. The new cultural history, post-colonial studies, and the "linguistic turn" augmenting, if not replacing social history, allowed for multiple angles of approach. By 1991, historians in Canada had freely explored a wide range of approaches regarding the emergence of a national identity. After independence, a high priority in Canada was assisting in the freeing of Ukrainian scholarship from Soviet-Marxist orthodoxy—which downplayhed Ukrainian nationalism and insisted that true Ukrainians were always trying to reunite with Russia. Revolt against Moscow meant freedom from an orthodoxy never was well-suited to Ukrainian developments. Inside Ukraine scholars welcomed the "national paradigm" that Canadian historians had helped develop. Since 1991, the study of Ukrainian nation building became an increasingly global and collaborative enterprise, with scholars from Ukraine studying and working in Canada, and with conferences on related topics attracting scholars from around the world. ^ "Ukraine :: History – Britannica Online Encyclopedia". Britannica.com. Retrieved 31 October 2011. ^ Riasanovsky, Nicholas V. (1963). A History of Russia. Oxford University Press. p. 199. ^ Riasanovsky (1963), p. 537. ^ "Ukraine – The famine of 1932–33". Encyclopædia Britannica. Retrieved 26 June 2008. ^ "Macroeconomic Indicators". National Bank of Ukraine. Archived from the original on 21 October 2007. ^ Inozmi, "Ukraine – macroeconomic economic situation". June 2009. ^ Gray, Richard (18 December 2011). "Neanderthals built homes with mammoth bones". Telegraph.co.uk. ^ Prat, Sandrine; Péan, Stéphane C.; Crépin, Laurent; Drucker, Dorothée G.; Puaud, Simon J.; Valladas, Hélène; Lázničková-Galetová, Martina; van der Plicht, Johannes; et al. (17 June 2011). "The Oldest Anatomically Modern Humans from Far Southeast Europe: Direct Dating, Culture and Behavior". plosone. Retrieved 21 June 2011. ^ "Trypillian Civilization 5,508 – 2,750 BC". The Trypillia-USA-Project. Archived from the original on 12 December 2007. Retrieved 16 December 2007. ^ "Scythian". Encyclopædia Britannica. Retrieved 12 September 2007. ^ a b Magocsi, Paul Robert (1996). A History of Ukraine. Toronto: University of Toronto Press. p. 27. ISBN 0-8020-0830-5. ^ М. Грушевський – "Історія України". Том І, розділ IV, Велике слов'янське розселення: Історія Антів, їх походи, війна з Словянами, боротьба з Аварами, останні звістки, про Антів. ^ "Ukrainian Tribal Divisions and Ethnographic Groups". Home.swipnet.se. Archived from the original on 18 March 2009. Retrieved 30 January 2011. ^ Yakovenko, N. Ukrainian nobility from the end of 14th century to the mid of 17th century. Ed.2. Krytyka. Kiev 2008. ISBN 966-8978-14-5. ^ Orest Subtelny (2000). Ukraine: A History. U of Toronto Press. p. 359. ^ Anne Applebaum. Red Famine: Stalin's War on Ukraine (2017). ^ Sandford Daniel (19 February 2014). "Ukraine crisis: Renewed Kiev assault on protesters". BBC News. Retrieved 19 February 2014. ^ "Ukraine crisis: Yanukovych announces 'peace deal'". BBC News. 21 February 2014. Retrieved 21 February 2014. ^ "Profile: Olexander Turchynov". BBC News. 23 February 2014. Retrieved 25 February 2014. ^ Taylor, Charles (28 February 2014). "Profile: Ukraine's ousted President Viktor Yanukovych". BBC News. Retrieved 4 May 2014. ^ "Crimea referendum: Voters 'back Russia union'". BBC News. 10 March 2014. Retrieved 4 May 2014. ^ a b "Ukraine Reform Monitor: August 2015". Carnegie Endowment for International Peace. August 2015. Retrieved 22 December 2015. ^ Bershidsky, Leonid (6 November 2015). "Ukraine Is in Danger of Becoming a Failed State". Bloomberg News. Retrieved 8 November 2015. ^ Kuzio, Taras (25 August 2015). "Money Still Rules Ukraine". Foreign Policy. Retrieved 22 December 2015. ^ Minakov, Mikhail; Stavniichuk, Maryna (16 February 2016). "Ukraine's constitution: reform or crisis?". OpenDemocracy. Retrieved 19 February 2016. ^ Roman Senkus, "Ukrainian Studies in Canada Since the 1950s: An Introduction." East/West: Journal of Ukrainian Studies 5.1 (2018): 3–7. ^ Bohdan Krawchenko, "Ukrainian studies in Canada." Nationalities Papers 6#1 (1978): 26–43. Liber, George. Total wars and the making of modern Ukraine, 1914–1954 (U of Toronto Press, 2016). Snyder, Timothy D. (2003). The Reconstruction of Nations: Poland, Ukraine, Lithuania, Belarus, 1569–1999. Yale U.P. ISBN 9780300105865. Shkandrij, Myroslav. Ukrainian Nationalism: Politics, Ideology, and Literature, 1929–1956 (Yale University Press; 2014) 331 pages; Studies the ideology and legacy of the Organization of Ukrainian Nationalists Especially by Dmytro Dontsov, Olena Teliha, Leonid Mosendz, Oleh Olzhych, Yurii Lypa, Ulas Samchuk, Yurii Klen, and Dokia Humenna. Himka, John-Paul. "The National and the Social in the Ukrainian Revolution of 1917-1920- The Historiographical Agenda." Archiv Fur Sozialgeschichte, vol 34 (1994): 95–110. Krawchenko, Bohdan. "Ukrainian studies in Canada." Nationalities Papers 6.1 (1978): 26–43. Yekelchyk, Serhy. "Studying the Blueprint for a Nation: Canadian Historiography of Modern Ukraine." East/West: Journal of Ukranian Studies 5.1 (2018). Viktor Andriyovych Yushchenko is a Ukrainian politician who was the third President of Ukraine from 23 January 2005 to 25 February 2010. Presidential elections were held in Ukraine on October 31, November 21 and December 26, 2004. The election was the fourth presidential election to take place in Ukraine following independence from the Soviet Union. The last stages of the election were contested between the opposition leader Viktor Yushchenko and the incumbent Prime Minister Viktor Yanukovych from the Party of Regions. The election was held in a highly charged political atmosphere, with allegations of media bias, voter intimidation and a poisoning of candidate Yushchenko with dioxin. The history of Kiev, the largest city and the capital of Ukraine, is documented as going back at least 1,400 years. According to legend, Kiev was founded by three brothers, Kyi, Shchek and Khoryv, and their sister Lybid. 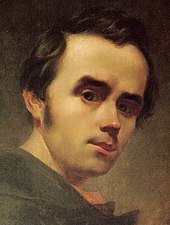 Kiev is named after Kyi, the eldest brother. The exact century of city foundation has not been determined. Legend has it that the emergence of a great city on the future location of Kiev was prophesied by St. Andrew fascinated by the spectacular location on the hilly shores of the Dnieper River. The city is thought to have existed as early as the 6th century, initially as a Slavic settlement. Gradually acquiring eminence as the center of the East Slavic civilization, Kiev reached its Golden Age as the center Kievan Rus' in the 10th–12th centuries. Belarus–Ukraine relations are foreign relations between Belarus and Ukraine. Both countries were successively ruled by the Polish-Lithuanian Commonwealth, the Second Polish Republic, and ultimately, the Russian Empire. Prior to the 1991 breakup, both countries were part of the Soviet Union as the Belarusian SSR and Ukrainian SSR when they were the founding members of the United Nations in 1945. Being Slavic nations, both Belarus and Ukraine share closely related cultures and are predominantly inhabited by the East Slavic ethnic groups of Belarusians and Ukrainians respectively, along with a few Russians. Today, the two countries share an 891–km border.